So when does a pie become a croustade/crostata or when does a tart become a galette? If you’re the one eating it, does it really matter? A galette (free form tart) is a pastry dough crust rolled out and instead of placing in a pie plate, it is transferred to a flat baking sheet. The center is filled or spread with a filling and the edges are folded around it. The edges can be left as they are or crimped or cut decoratively. It is then baked until the crust is browned and the filling is cooked. Fruit fillings are best for free form tarts and their cousins, the galettes and crostatas. 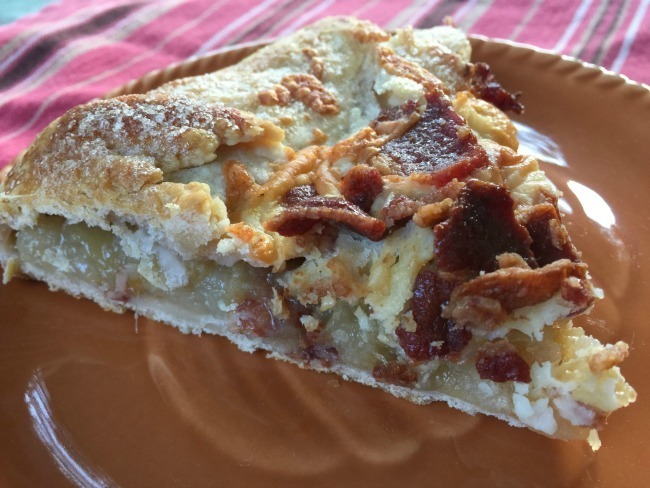 You might be thinking that bacon doesn’t seem to belong in a dessert tart, but you would be mistaken. 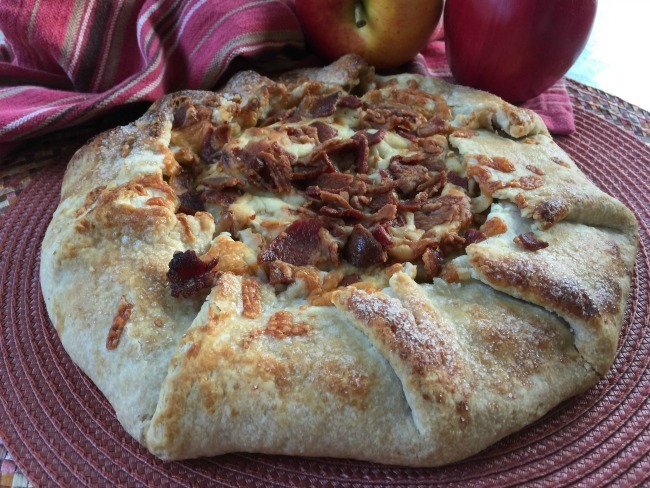 The richness of the Petit Jean Hickory Smoked Bacon marries quite well with the classic combination of apples and cheddar. And it gets even more interesting with a kick of heat from hot pepper jelly! When apple season in full swing during the fall months in Arkansas, this is one of our favorite desserts. It is not overly sweet which suits our family just fine. It’s perfect for family weeknight dinners or those special events with friends. 2.) Grate butter with either a food processor or box grater; chill in freezer at least 15 minutes. 3.) In a food processor, pulse flour and salt until combined, about 8-10 seconds. 4.) Scatter very cold butter pieces over flour and pulse until the flour appears sandy. 5.) Continue to pulse while adding lemon juice 1 tablespoon at a time until dough begins to form small balls that hold together when pinched, about 10 pulses. 6.) Turn the crumbly dough onto a lightly floured counter; gather into a rectangular pile. 7.) Beginning at the far end, use the heel of the hand to spread out a small amount of dough against the counter. Continue this smearing with remainder of the dough. 8.) Press dough into a 6-inch round, wrap tightly in plastic wrap and refrigerate at least 2 hours. 9.) Unwrap chilled dough, placing it between two lightly floured sheets of parchment paper. 10.) Gently roll dough into a 12-inch circle. Slide parchment-covered dough onto a rimmed baking sheet. Refrigerate at least 20 minutes or until firm. 11.) In a large skillet, cook bacon until crisp. Drain and set aside; crumble. 12.) Grate white cheddar cheese; cover and set aside. 13.) Preheat oven to 375 degrees. 14.) In a small saucepan, melt hot pepper jelly over medium heat. 15.) In a large bowl, combine apple slices, half of the crumbled bacon, spices and melted jelly. Gently combine. 17.) Remove baking sheet with dough from refrigerator; discard top sheet of parchment. Allow to soften slightly, about 10 minutes, but still remain chilled. 18.) Leaving a 2 ½-inch border, begin arranging the apples in a stacked circle then fill in the center with remaining slices. Sprinkle evenly with ½ cup granulated sugar. 19.) Fold outermost 2 inches of dough up and over fruit leaving a ½-inch border between fruit and edge of tart shell. As you fold, pleat dough every couple of inches, gently pinching pleats together to secure them if needed. 20.) Lightly brush top and sides of dough with cream and sprinkle with 1 tablespoon of sugar. 21.) Cover loosely with foil; bake for 15 minutes. 22.) Remove foil; bake for an additional 15 minutes. 23.) Sprinkle filling with grated cheese and top with remaining bacon crumbles; return to oven 10-15 minutes until crust is golden and cheese is melted. 25.) While I generally serve this as is, it’s tartness contrasts deliciously served with a sprinkling of powdered sugar or a dollop of whipped cream or ice cream. 26.) Notes: The galette is best eaten warm on the day it is made, within 3-4 hours. Reheat it on a parchment-lined baking sheet at 350 degrees for 10 minutes. While the crust may be made in advance, the galette should not be as the dough will become soft. 27.) The hot pepper jelly gives an interesting kick to the galette. I like to use my homemade Peach Habanero Jam with Ginger, but you may choose any you prefer. 28.) I like to draw a 12-inch circle on the parchment paper before rolling the dough. This helps me judge the correct size.